In the second of my back-to-back post-show Q&As at the King’s Head Theatre this past week, I was at the Off West End powerhouse’s original home in Islington for Atticist’s first London revival of David Greig’s 2002 play Outlying Islands. Outlying Islands is only the third production from Atticist, but the company has already earned a fearsome reputation for top quality drama. They launched at the 2015 Edinburgh Fringe with new play Life According to Saki, which won the Carol Tambor Award for the best of the festival and nabbed a New York transfer. Their follow-up was last year’s Offie-nominated revival of Steven Berkoff‘s 1975 verse play East at the King’s Head, which was so successful the King’s Head invited Atticist to become an associate company. David Greig‘s play, originally seen at Edinburgh’s Traverse Theatre and transferred to London’s Royal Court, is also steeped in poetry and magical realism. Set on a remote Scottish island in 1939 as the clouds of war gather over Europe, two young ornithologists have been sent by the ministry on a mission. Is their purpose purely to study the native bird population? Or to examine the island for some other testing purpose? Outlying Islands is directed by Jessica Lazar and designed by Anna Lewis, who have worked on all three Atticist shows to date. At the post-show Q&A, we learned how much the success of the creative team’s collaboration has driven the company’s development as well as their play choices. 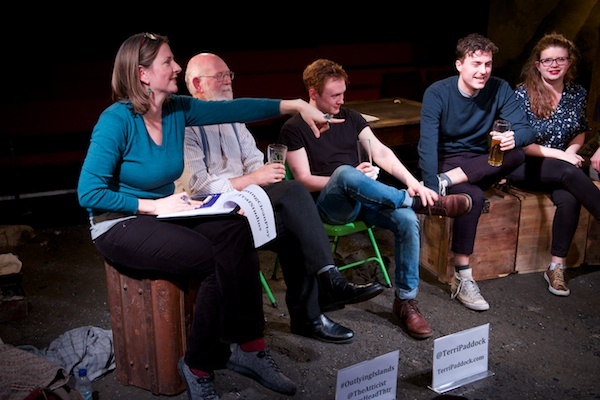 We were also joined by the cast – Tom Machell, Jack McMullan, Rose Wardlow and Ken Drury – for more insights on the historic inspirations for Greig’s story, travel as research (Outer Hebrides, here I come) and the challenges of playing dead. Outlying Islands continues at the King’s Head Theatre until 9 February 2019. Coming Clean Q&A video and photos: Why has it taken 37 years for Kevin Elyot's play to get its West End premiere?